A dishwasher may not seem like a critical part of your kitchen—at least not until it breaks down and the dishes start piling up! After spending a couple of nights washing your dishes by hand, you’ll realize that your dishwasher is more than a luxury. At Tiger Mechanical, we know how what an inconvenience a broken dishwasher can cause. Contact us today for fast, reliable dishwasher repair in Gilbert, Mesa, Scottsdale and throughout Maricopa County. Our expert support staff is standing by to take your call. At Tiger Mechanical, we can address all these problems and more. We are factory- authorized to work on the most high-end dishwasher brands including Avanti, Bosch, Blomberg, Gaggenau, Viking, and Thermador. We also repair popular brands such as Maytag, Whirlpool, Kenmore, LG, Samsung, and more. 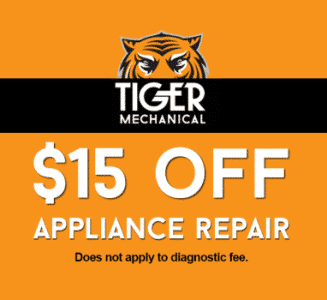 Tiger Mechanical is a leader in dishwasher repair in Gilbert and throughout Maricopa County. With an A+ rating from the Better Business Bureau and over 25 years of field experience, Tiger Mechanical offers a 5-year warranty on parts and 1-year warranty on labor to ensure that your issue is resolved correctly in as little as one visit. While dishwashers periodically require maintenance, there are a few tips you can follow to keep your dishwasher in the best possible shape. Reduce scraps. Scrape your dishes thoroughly. Do not rinse before loading your dishwasher. Run hot water before you run the dishwasher. By running hot water before you run the dishwasher, you will ensure that the cycle begins with hot water rather than cold. Run an empty load with a cup of white vinegar. Any appliance that uses water will experience build up over time. Vinegar is a cheap and easy way to reduce build up. Clean your traps and seals. Buildup can occur in your dishwasher’s trap and the seals around the door. It is important to regularly clean these areas to prevent buildup. Check your water temperature. You can adjust your water temperature on your building’s water heater. The ideal temperature for washing dishes is between 120 and 125 degrees Fahrenheit. Test your water. Hard water can cause buildup both on dishes and in your appliances. Getting your water tested can provide treatment options to resolve this issue.